E.M.C. Mfg mdl. CM-2044/3 Beam Profile Cutting Machine s/n 95-240- 184 w/ (3) Torch Heads, Auto Lighting. CM mdl. 7-75 Hydraulic C-Frame Web Punch. Marvel Series 81 mdl. 81/M3 Vertical Miter Band Saw s/n D-413 w/ Hydraulic Clamping, Coolant. Large Capacity Roller Transfer System. P &amp; H Jib Crane w/ CM Loadstar Electric Hoist. 2008 Krras Machine mdl. 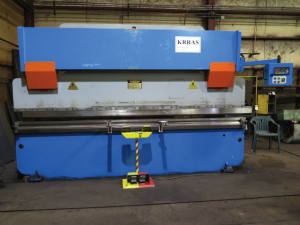 BEND 160.37 175 Ton x 12’ CNC Press Brake s/n 8280 w/ Krras Controls, 12’Bed Length, 12” Throat, 126” Between Uprights, 4-Position Die Base. 2005 Koike Aronson mdl. PLP-2500 “Plate PRO” 8’ x 20’ CNC Burning Table s/n 41513 w/Koike KAR CNC Controls, Hypertherm MAX200 Plasma Cutting Power Source and Cutting Head, Gas Torch Head and Controls. 10’ Power Plate Roll w/ 8” Rolls, 7.5Hp Motor. 2008 Durmazler Durma IW110BTD 110 Ton Iron Worker s/n 663008349 w/ Punch 1.58” thru .78” Cap, Shear .59” x 24” Cap, Angle Shear 6” x 6” x 3/8”, 3” x 3” x ¼” cap, Bar Shear 1.97” Square and Round Cap, Coping Notcher 2 1/8” x 4” Cap. Metal Muncher mdl. MM61W 49 Ton Iron Worker s/n 31998888 w/ Punch 13/16” thru ¾”, 1 1/16” thru ½” Cap, Flat Bar Shear 1” x 6”, ¾” x 9”, ½” x 10”, 3/8” x 15”, ¼” x 10”, 3/16” x 22” Cap, Bar Shear 1 ¼” Square, 1 3/8” Round Cap, Angle Shear 4” x 4” x 3/8” Cap, Coping Notcher 3” x 3” x 3/8” Cap. 2007 RMD Rusch Machine &amp; Design mdl. 175 Hydraulic Tube Bender s/n 37894202 w/ Roller Stand. Enerpak 3” Hydraulic Tube Bender Set w/ Ram-Pac and Enerpak Electric/Hydraulic Power Units, Hand Units and Rams. Unknown mdl. 812-498 70 Ton Hydraulic C-Frame Beam Punch s/n 812-498- 18087 w/ Hydraulic Unit and Cart. Niagara mdl. 341 15-18 GA x 43” Hand Roll s/n 28755 w/ Rolling Stand. Hyd-Mech mdl. S-20 Series II 13” Miter Horizontal Band Saw w/Coolant. Hyd-Mech mdl. S-20 13” Miter Horizontal Band Saw w/ Coolant, Conveyors. Pedrazzoli Troncatrice “Super Brown 350” Miter Cold Saw s/n 020691 w/ 2-Speeds, Work Supports. Carlton 11” Column x 5’ Radial Arm Drill w/ 60-1500 RPM, Power Column and Feeds, 18” x 24” Tooling Block. 2005 Scotsman mdl. GN3-DE- 220V 4” Coping Sander w/ Built-In Dust Collector. Almi 4” Miter Coping Sander. Atlas Copco GA30 40Hp Rotary Screw Air Compressor w/ Elektronikon Controls. Saylor-Beall 5Hp Vertical Air Compressor w/ 80 Gallon Tank. Buffalo No.22 Deep Hole Pedestal Drill Press s/n 62-3733. Craftsman 20” Pedestal Drill Press. 60” x 285” Steel Fabrication Table. 60” x 127” Steel Fabrication Table. Binks B4 Pneumatic Paint Pump. Miller MP-75E 750 Amp CP-DC Arc Welding Power Source w/Miller R-115 Wire Feeder. Miller PC-65E CP-DC Arc welding Power Source s/n JB534433 w/Miller S-52E Wire Feeder. Miller Invision 456P DC Inverter Arc Welding Power Source w/Miller 60 Series Wire Feeder. Lincoln CV-400 CV-DC Arc Welding Power Source s/n U1980204928 w/ Lincoln LN-7 Wire Feeder. Lincoln Idealarc DC-400 CV-CC- DC Arc Welding Power Source s/n AC523460 w/ Lincoln LN-7 Wire Feeder. (2)Lincoln Idealarc R3S-400 CV-DC Arc Welding Power Sources s/n AC523460, NA w/ Lincoln LN-7 Wire Feeders. (2)Lincoln Idealarc R3R-400 Variable Voltage DC Arc Welding Power Sources s/n’s AC570619, AC547268. Birdsell 400 Amp DC Arc Welding Power Source s/n 0772427. Lincoln Invertec V350 PRO Inverter Arc Welding Power Source w/Lincoln LN-7 ire Feeder and Cart. Miller CP-300 CV-DC Arc Welding Power Source s/n JK721485 w/Miller 70-Series Wire Feeder. Miller CP-300 CV-DC Arc Welding Power Source s/n KA855464 w/Miller R-115 Wire Feeder. (2)Lincoln Idealarc CV-300 Arc Welding Power Source s/n’s AC776618, NA w/ Lincoln LN-7 Wire Feeders. Miller Deltaweld 300 CV-DC Arc Welding Power Source s/n KE637081 w/ Miller S-22A Wire Feeder. Miller CP-250TS CP-DC Arc Welding Power Source s/n HF882092. Miller Syncrowave 250 CC-AC/DC Arc Welding Power Source s/n KF899408. Lincoln LNP250 G9PRO Gas Powered AC/DC Welding Power Source / 9000 Watt Generator Set w/ Onan Performer 18XSL Gas Engine. Tru-Weld SC2000 CC-DC Stud Welder w/ Gun. Pro-Weld ARC-1850 Stud Welder w/ Gun. Hypertherm PowerMAX 800 Plasma Cutting Power Source. Miller XR-A Extended Reach Wire Feeder and Miller Spoolmatic 30A Spool Gun. Miller Spoolmatic 30A Spool Gun. Miller S-32P Voltage Sensing Wire Feeder. (2) Phoenix Dry Rod Type 300 Electrode Stabilization Ovens w/Stand. (3) DeWalt DWE1622 Magnetic Base Drills. Milwaukee and Jancy Magnetic Base Drills. (3) Hilti DX650 Fastening Tools. Bosch and DeWalt Angle Grinders. Black &amp; Decker Electric Impact. Rigid Pipe Dies and Handles, Pipe Cutters and Vises. 1997 International 4700 DT466 20’ Stake Bed Truck Lisc# Z92 3DJ (UT) w/ Diesel Engine, 6-PLUS Manual Trans, 129,136 Miles VIN# 1HTSCAAM2VH435198. 1989 Ford F-150 Custom Pickup Truck Lisc# 577 VPB (UT) w/ 5L Gas V8 Engine, 4-Speed Manual Trans, Dual Gas Tanks, 101,735 Miles VIN# 1FTEF15YXKPA16631. Clark mdl. 714 28,000 Lb Cap 60’ Reach Boom Truck s/n 714-732 w/ Outriggers, 5066 Hours (MAY HAVE BLOWN HEAD GASKET). Hyster KE Karry Krane mdl. B11L2121E 6000 Lb Cap Crane Truck w/ Pneumatic Yard Tires. Caterpillar V155C 14,000 Lb Cap Diesel Forklift s/n 8TG00419 w/3-Stage Mast, 218” Lift Height, Side Shift, Pneumatic Yard Tires. Hyster 100 mdl. H100XM 9450 Lb Cap LPG Forklift s/n K005D02300X w/ 2-Stage Mast, 168” Lift Height, Side Shift, Dual Pneumatic Front Tires (NEEDS BATTERY). 3-Ton Bridge Crane w/ Approx 33’ Span. (6) Cleveland Tramrail 3 Ton Bridge Cranes w/ 30’ Spans. 2 Ton Bridge Crane w/ approx 36’ Span. (2) R.E.A. Large Capacity Chain Rolls. Sheet Clamps to 5 Tons.